When looking spring sewing projects, I take inspiration from the runway. I look at the most common trends that designers are showing for the upcoming spring fashion season and implement them into an Ann Normandy Design sewing pattern. I have just returned from a holiday escape from the snow and cold weather to warm, sunny tropics and ready for spring and summer sewing! Let’s get on with it! 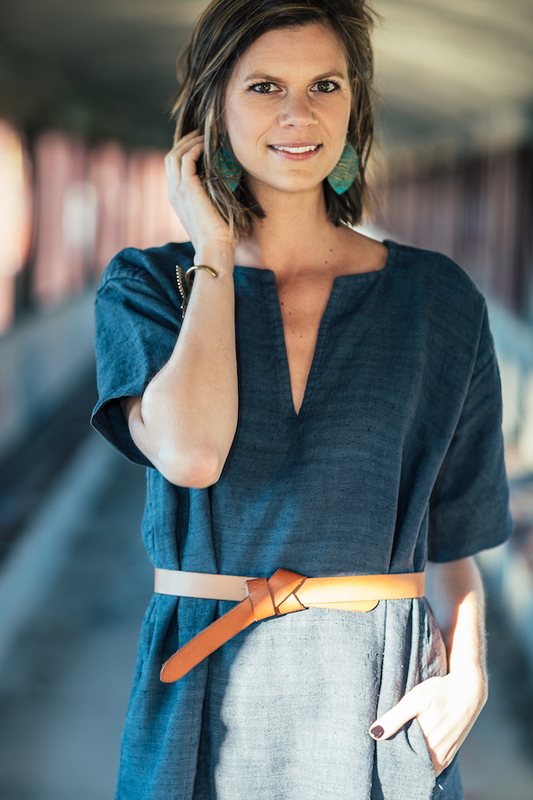 The trends will change, but your sewing pattern doesn’t have to. Ann Normandy patterns are specifically designed to be timeless and reusable season after season. You can take your favorite sewing pattern and pair it with your favorite trend of this year for a refreshed wardrobe. The rule of thumb for a wardrobe that stands the test of time is to have 70% silhouettes that are classic and 30% that are trendy. This allows you to maximize the time and effort you spent sewing a garment – and still sew that same pattern again in an on-trend color or fabric. Here are some of the most significant trends on the radar for this spring. W Magazine showing the bermuda/biker shorts trend in all it’s glory. These long, fitted and form-fitting shorts were seen last season and are returning this upcoming spring again. The newly released Ann Normandy Bermuda Shorts sewing pattern is a perfect example of this longer, slim short trend. We’ve moved from very short shorts the last few seasons to very wearable shorts this season. If you haven’t sewn shorts before, the Bermuda Short might just be your perfect short. Worn just above the knee, the Bermuda Short is even work-appropriate in a casual office. Linen is perfect for this pattern, also consider making a statement piece with a fabulous brocade. So many possibilities! Now through April 20th, 2019, save 25% on the Bermuda Shorts sewing pattern! Use coupon code: SPRINGSHORTS25. A sheer garment that reveals the garments underneath is on trend this spring and summer. Some runway looks are bold with biker shorts and bustiers, with and without bras exposed, or ultra cool styling seen on the NY streets during fashion week. I’m going to reel that idea in a bit for myself and create a chic, sheer look as a swimsuit coverup. The look can be created by sewing either one of the Cold Shoulder Tops, Slip Dress and the Maxi Dress in a sheer woven, such as an Irish linen, then pair it with your favorite swimsuit, add some accessories, such as bold cuffs or statement earrings to create a polished look worthy for lunch or even post beach cocktails. I’ll be creating a look or two using a fabulous sheer linen and will be posting on a future blog post. Keep an eye out for that! Ann Normandy Design loves square necklines! The square neckline is big for spring 2019, and many Ann-Normandy Design dress patterns already feature this design detail including the Maxi Dress, Shift Dress and the Short Sleeve Dress. Try the Shift Dress and the Short Sleeve Dress as longer tops or tunics as well, by just cropping the dress at your preferred length and hemming. The Ann Normandy Design Maxi Dress. Earth tones are taking over the runway and fashion magazines. Neutral palette colors like sand, cream, caramel, khaki, and beige are the most common. Use these colors with any pattern in a natural fiber (Linen, cotton, woven fabrics, knits!). Yellow (marigold) is in a universally flattering yellow that is booming in popularity for the spring. If a bright yellow like marigold isn’t your thing, try a pale yellow for spring. It pairs well with the earth tone trend and looks especially lovely on warmer skin tones. Marie Claire showing the lovely pale yellow on the Spring 2019 runways. 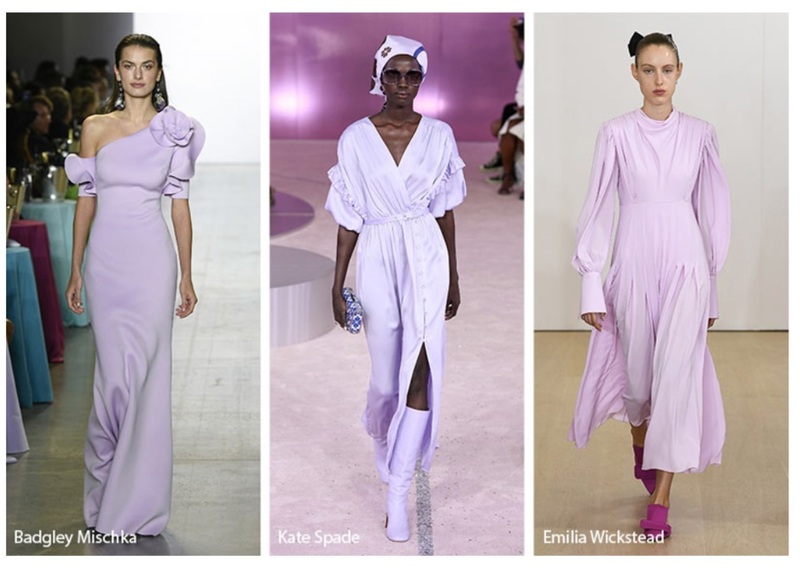 Lavender is another on-trend color for 2019, and it comes in both warm and cool variations so you can pick the one that is most flattering to your skin tone. Lavender can sometimes be too “sweet”, so pair it with black, navy or camel for a more sophisticated look. Glowsy.com, a terrific website showing all the runway trends. Check it out for all the color trends, including the Pantone Colors of the Year on the runways. Tie-Dye is making a comeback this season. This is not the tie-dye that you did at a summer camp. Instead, some are a more sophisticated print, and others, an understated with neutral tones to create texture in your outfit. From the pages of W Magazine. Tie Dye is taking over the runway for Spring Summer 2019. This can be done at home! (Stay tuned tutorial on this) Subtle and sophisticated dye techniques add dimension and distinction – not only does sewing allow you to create one-of-a-kind garments, but using hand-dyed fabrics adds an extra layer of uniqueness to your look. Dye the fabric before you cut it out. Linen, Kona Cotton, and cotton gauze all dye beautifully, as do rayon/linen blends. Looking for a botanical DIY dye options? Check out the book, Natural Color by Sasha Duerr. It’s a terrific book on creating vibrant colors using plants. Natural Colors, by Sasha Duerr. If you’re looking for botanical dye supplies online, Botanical Colors based in Seattle, WA is a fabulous one stop shop. The proprietor, Kathy is a wealth of information and pure joy to work with. Botanical Colors, located in Seattle, WA. The perennial “It” print. This can be applied to any sewing pattern. No matter if it is bold or understated, it will still be on trend. Black and white polka dots are a classic print that is universally flattering. It’s a fresh combo – particularly paired with the season’s neutrals – adds sophistication to your outfits. Big dots, small dots - it’s entirely up to you! Pair a black and white dot tunic with a pair of camel linen wide leg pants or Bermuda shorts and strappy sandals or pointy toe flats. Every year I love to look at what is new in fashion. It inspires me to sew and enjoy inspiring others to sew as well. A truly versatile wardrobe incorporates beautifully sewn classic pieces you wear year after year. And it also includes new versions that you sew with on-trend colors for the new season. These new trends for spring 2019 should inspire you to pull out your favorites and sew them again! Check out our Pinterest board for more Spring 2019 trends that are wearable and can be re-created using your favorite (tried and true, and tested!) Ann Normandy Design sewing patterns. What are your favorite trends for Spring and Summer?